You’ve heard the benefits of growing your mailing list, but sometimes it seems like too much darned work. Because have you ever considered how hard you have to work when you DON’T have a list? It’s one of the biggest mistakes of a freelancer. You get bogged down in client work and then suddenly, a few clients drop off. You have to scramble to fill that space in your client calendar, but wouldn’t it be much easier if you already had a mailing list of potential clients? Or what if you’re an information product creator or ebook author? You get really excited about you next release, but nothing happens…because you don’t have a captive audience to sell it to. Imagine if each time you released a new product or book, your readers were just waiting to buy. As a writer, there is no reason why you can’t have a ready source of clients and customers. 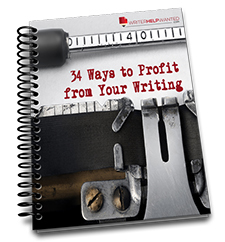 You’ve already got the writing talent that makes it easy to grow your list. Put those skills to work with these proven list building ideas. Offer a useful free gift. This is one of the most common and popular tactics for building a list. Give your visitors something for free if they sign up. It could be a report, checklist, worksheet, video or anything you can think of. Remember, if you want your clients to hire you to write for them, don’t teach them how to write…but teach them how to use the writing you do to effectively grow their businesses. Include a graphical representation of your freebie. Whether it’s an ebook cover, CD or DVD (to reflect an audio or video recording), these visual elements can draw the eye into your offer and give your freebie a higher perceived value. Both those things will increase your opt-in rates. Create a focused opt-in or lead magnet page. It’s only purpose is to entice your visitors with the benefits of signing up for your list. Drive most of your traffic here, so you can grow your list more quickly. Share testimonials. If you’ve received feedback about your freebie or being on your mailing list, publish it. This kind of feedback is an important element of social proof that makes people want to sign up. Clearly tell the benefits and have a clear promise. Tell them in no uncertain terms what the benefit is of being on your list. This goes beyond the free document you’re offering them, but tell them the benefits of continuing to get email from you. Set expectations for how often they receive mail. People hate spam, but if you tell them exactly how often you’ll mail them, (E.g. “We’ll email you a few times per week with easy to digest gardening tips”) they’ll often be much more willing to sign up. Use a lightbox. A lightbox is a popover that greys out the rest of the screen when it pops over. It’s one of the most attention catching ways to build a list. You can also use pop-ups, page footers and other tools that let you display an opt-in offer to your visitors. Link to a sample issue. Link to an issue of your newsletter that people can look through. Make sure to put your best foot forward. Use Facebook, Google Adwords and YouTube Ads. Free content and offers are perfect for creating successful ad campaigns. Write a guest post around your freebie. For example, write a guest post about “17 Mistakes AdSense marketers make” if you have a free report about how to succeed with AdSense. Promote your list on social media. Especially try posting relevant responses to popular hashtags in your industry. Get your friends to share your content too. Create a viral video. Have a link to your signup page on the video (you can do this easily with YouTube’s editing tools) and also include it in the video’s description. Launch a podcast. Promote your list in your podcast or have them opt-in to receive instant notifications of new episodes. Offer a “Secret Blog Post”. Tell your blog audience that you’re going to release a blog post only to your email list. Give them hints on what it will be about. What problem will you solve? What secret will they learn? Give list members discounts. If you sell products or arrange for special offers, give the best deal to your subscribers. Use this as leverage to get new people on your list. Add a signup box on every page. Add it on the right, on the bottom or both. Make sure it’s visible throughout your website. Do a solo ad mailing. Buy solo ads from other people with mailing lists to promote your list. Do an ad swap. Mail a promotion to your list, then have someone else do the same with their list. Tell people who email you their question will be answered in the email list. Answer questions on your list rather than privately. Answering questions privately takes up too much of your time and benefits only one person, but when you can turn that answer into email content, everyone wins. Build your customer list. A customer list is even more valuable than a subscriber list because once a satisfied customer buy once, they’re more likely to buy again. Make sure you’re including your customers in your mailing list. Wall off long content. For example, on a 5 page article, make people sign in to their mailing list address after 2 pages to continue reading. Get them to share. Encourage your website visitors to refer a friend, share articles, etc. Install a “refer a friend” or “email this article” script/plugin. Add a note to the end of your emails to encourage sharing as well. Run a pay-per-lead affiliate campaign. Pay affiliates for every email signup they generate, rather than for sales. If you know what your short term or lifetime customer value is, you can come up with a cost-effective amount to pay your affiliates. Make it mandatory for free online tools. Give away free web tools, but make sure they sign up before using it. Add a signup form to your Facebook page. Facebook makes it easy to create a “sign up” button on your page and most autoresponder have a tool to make it easy to integrate with Facebook. Use press releases. Distribute press releases to online and offline media. Encourage press release readers to get your free offer. Have a sweepstakes or giveaway on your site. Encourage entrants to claim their free gift and subscribe to your mailing list. TIP: Don’t automatically add sweepstakes entrants to your main list as it’s not likely they’ll remember you or be particularly responsive. Have them opt-in directly to hear more from you. Host a free webinar to collect names and addresses at registration. Or you can charge for the webinar and grow your list of customers instead. Be a sponsor. Sponsor sweepstakes or giveaways on other sites by offering a prize. Have the website link back to your free opt-in offer on their sponsor page. Get interviewed. Media is all around us and you don’t have to be on a big TV show to get exposure. Get interviews on targeted podcasts, webinars and have them share your free offer. Growing your list is all about sharing great content and each day you want to grow your business (that’s every day, right? ), should include list building in your schedule. Do this consistently and your list will continue to grow, giving you a steady steam of new potential clients and customers.